As Ned Flanders would say, education in the U.S. is in “a dilly of a pickle.” At the risk of sounding like a broken record, the cost of education has become unsustainable. Student loan debt is over $1 trillion, unemployment remains high for the recently graduated, and non-traditional students — older people, single mothers, workers looking to re-train — are returning to academia and learning programs in droves, putting even more competitive pressure on already-scant on-site resources. Higher ed institutions struggle with the cost of expanding to meet demand. Yale, for example, recently decided to add 250 students to its incoming class, which came with a price tag of a quarter of a billion dollars. Luckily, a number of startups are tackling the problem, which, along with the maturation of online content distribution channels, are helping to lower the cost of higher, primary, and continuing education — both making it easier for teachers to do what they do best as well as transforming learning into something that’s more engaging and personalized for students. Startups like Khan Academy, 2tor, ShowMe, Udemy, Udacity, Grockit, Coursera, and StraighterLine are all beginning to show how easy it is to flip the educational process — in other words, to use video and advanced web platforms to make learning more affordable and effective. However, while these startups should be recognized for their mission-driven approaches, some of these startups evidence undercooked business models, obviously a problem for for-profit businesses when the funding (if there is any) dries up. There’s also plenty of money to go around in Silicon Valley right now, and many startups have become way too focused on raising seed and Series A financing, which can be detrimental to the system and a distraction for founders. That’s why the story of Lynda.com has such relevance in today’s landscape. Founded in the ’90s, the company is, compared to the slew of year-old edtech startups, an old-hand. For those unfamiliar, Lynda.com offers a virtual video library of over 1,200 educational, how-to videos. Unlike the awesome Khan Academy, Lynda’s video courses are taught by industry experts, working professionals, and veteran teachers, served up in installments for a monthly subscription fee of about $25. In 2010, Lynda delivered over 1,000 hours of content, and while it provides its paid online learning content to individuals, today it also works with nearly all of the Ivy League schools as well as companies, like Disney, Time Warner, Sony, Pixar, ABC, and HBO to supplement their learning content. What’s also different about Lynda, and perhaps old-school given today’s emerging DIY online video models, is that it produces 90 percent of its content in-house. It’s a big video production operation beyond simply being an online distribution platform. Since the beginning, Lynda.com has been focused on tech content, offering how-to videos on some of the most popular apps from Adobe, Apple, Autodesk, and Microsoft — on everything from web design to learning to use Excel in a way that doesn’t make you want to blow your brains out. Content companies have struggled to monetize on the Web, and there has been plenty of debate over the effectiveness of paywalls. Newspapers are finally starting to see growth in their circulations, and ABC’s figure for daily Times paid digital subscribers was 807,000, with the WSJ in second at 552,288. Of course, as the NYTimes points out, under audit rules, newspapers can count paid digital subscribers more than once if they have access to multiple platforms, like apps, tablets, etc. This means that, as a content company, Lynda.com is looking pretty good in comparison. Yes, the Times’ digital offerings are much younger, but Lynda currently has over 1 million paying members and saw 42 million uniques over the last 12 months — a 20 percent increase from the year prior. That’s not mind blowing, as there are a number of digital publications and blogs that see that much unique traffic in a month, rather than a year. But the real kicker is that Lynda hit $70 million in revenues in 2011. Co-founders (and couple) Lynda Weinman and Bruce Heavin started by sinking $20K from their savings into Lynda. They were profitable, Heavin says, within a few weeks, and they haven’t taken a penny of outside funding since. And that’s not for lack of offers, as both founders hinted that sizable investment offers have been put on the table on a number of occasions. But the company has been content to fly under the radar and rely on word-of-mouth marketing, subscribing to a “if you don’t need money, don’t take it” policy. The real key to the company’s success is how it’s become an alternative to the Demand Medias and eHows of the world. Lynda.com won’t blow you away with shiny graphics or interactivity, its videos often do a lot of screen-sharing, with narration from experts laid over it. But, as the company now has some-300 employees and has an increasingly professional studio north of Los Angeles, the production quality of its videos is high. Compared to Khan, YouTube how-tos, or eHow, Lynda’s videos are offered in installments, and depending on what users want to learn, they can graduate to more advanced content as they move up the ladder. 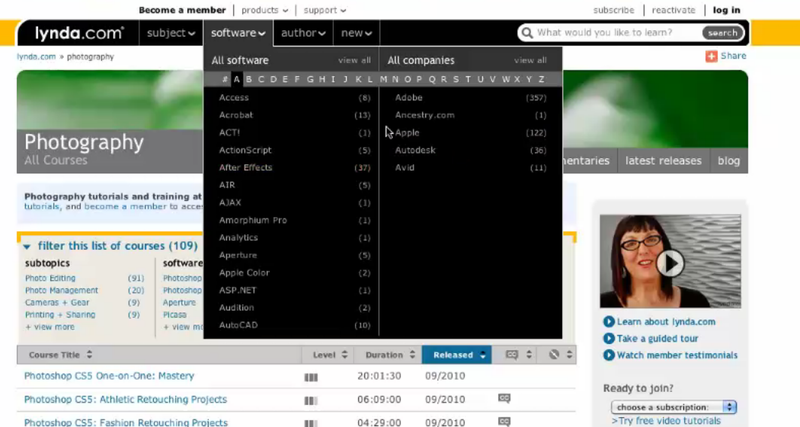 For example, Lynda is about to publish its 500th course on Adobe apps and software, which is ridiculous. CS6 begins shipping on Monday, and Lynda already has courses for the creative suite ready to go. These courses on advanced PhotoShop, for example, may include up to 10 hours of content, broken down into 60-odd subgroups. While it’s not true for every subject, Lynda.com can be as basic or as advanced as you’re willing to go. And, with the growing interest in programming and coding education, the buzz around CodeAcademy being one example, the company is beginning to get very serious about expanding and diversifying its content around programming languages and web development. For educators and teachers, part of the appeal of Lynda is that they’re guaranteed a paycheck for the content they help produce. Since Lynda herself is a veteran of the publishing industry, the site’s compensation model is not unlike which one finds in book deals. Once teachers are vetted (and the co-founders told me they find more than 50 percent of the time that authors don’t necessarily make great teachers), they’re given an advance for their work. From there, the company offers a cut of revenues depending on the popularity of their videos. Even if the videos don’t blow up, the teachers are guaranteed that supplementary revenue stream. But, somewhat surprisingly, the co-founders tell us that nearly 90 percent of its educators earn their entire annual income by producing videos for Lynda.com. In the end, having been able to weather the stampede of content producers to the Web, and grow its business to $70 million in revenues, it seems that its founders might have some valuable perspective for startups and young entrepreneurs looking to do the same. Like many others, the co-founders began the process with other income streams, and it took almost 5 years before its online content was outpacing the number of courses they themselves were teaching in the classroom. But what they kept coming back to was the fact that they started their business not as eager young people looking to get rich quick or find some niche to exploit, like becoming the Airbnb for pets, they were experts — and they were passionate about education. Weinman herself had been working in web design and film special effects, along with teaching, for years — and had published several books. The co-founders attribute the success of Lynda.com to becoming industry insiders before becoming entrepreneurs, and on focusing on the product before profit. Allow your customers to keep you honest, they said, and listen to their feedback to help push your business forward. Early on, everything they had and made was poured into Lynda.com. As Heavin said, it took years of “walking through the desert,” before they were able to see any real profit, but being passionate about finding better ways to educate people using online tools, and taking into account the modalities of learning — being intimately familiar with their user or target customer — can lead to a positive result. As to what’s next, Lynda.com just added a course queue so that users can keep track of and save subjects or chapters they’re interested in watching later and will be continuing the expansion of its educational content for developers. And, since 20 percent of its users are international and its content is presently English-only, the company hopes to eventually begin translating its videos into other languages. Hopefully sooner rather than later. 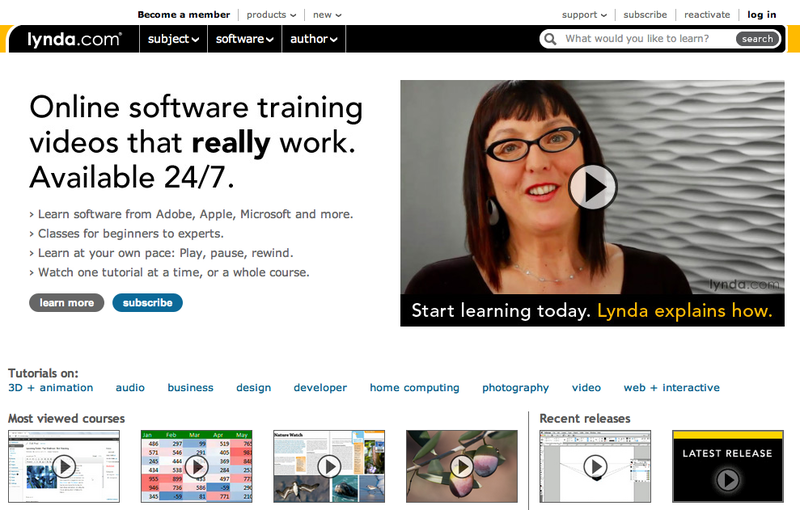 For more on Lynda.com, check them out at home here.